Big Brother Recap: Will The House Flip On Paulie? The road kill twist continued to have a ripple effect throughout the house. Paul was not impressed at being the nominee and made that known to his fellow alliance members. Victor was quick to point the finger about who made the decision. Poor Michelle looked away at the wrong time and it made it look like it was her. This shows that the twist is working. Paranoia in the house is what makes for GREAT TV. 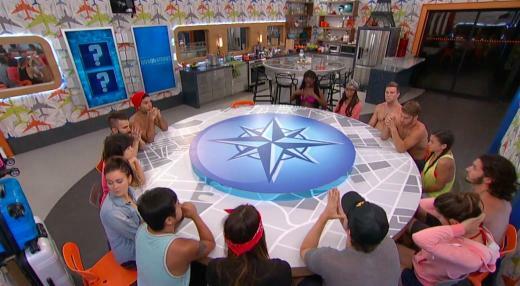 Jozea continued to chant that he was the top dog in the house and some of his alliance members even started to believe it. Nicole ruffled some feathers when she picked Corey to play in the veto, but it was actually a good idea. He’s part of the Freakazoids, so picking him wouldn’t scream that she is in an alliance with him. At least no one called her a fruit loop dingus this time. The competition genuinely seemed pretty difficult. Nicole and Corey almost fainted during it. That wouldn’t have been good for either of them, but they didn’t need to win the competition and it showed. Paulie was trying too hard and that’s what ultimately cost him the veto. Paul decided to just pile all the blocks on top of one another and it worked. After a tense final few minutes, Paul won the POV and it helped Jozea with his observation that he was the next Messiah. This really is going to be the biggest blindside in many years for the show and it’s going to be great. That’s if things don’t change too much before the eviction. Jozea was super quick to call a house meeting, but he didn’t exactly keep it on the down low. He left a lot of people out of it. Does this dude even know he’s in the Big Brother house? His game is tedious and the fact he practically forced the other houseguests to go after Paulie was horrible. James was hilarious when he just walked into the meeting. James may not be a competition beast, but his social game might just secure him a long tenure in the game. He just needs to try and start winning competitions and he could be a huge threat. Spy Girls made a huge mistake by sending Bridgette upstairs to get information from the veterans. What was going through Bronte’s mind when she told every single person in the have not room that she had Bridgette spying upstairs? The newbies don’t know much about Big Brother. I’d be happy the veterans at final four. They know what they’re doing. Obviously they have the advantage of playing the game before, but they do make the show more interesting. Paulie decided to confront Jozea about him not getting an invite to the meeting, but Jozea flat out denied that he was pushing the other houseguests to take him out of the game. Did Jozea seriously think that Paulie wouldn’t know about the plan? This annoyed Paulie, who now knows how much of a threat Jozea is. Paulie isn’t part of any big alliance, but expect Tiffany to try and pull him into the Eight Pack alliance. They have a connection because they have that big sibling twist in common. Right? I don’t trust Tiffany. There’s every possibility that she could be Vanessa with a new hair color. They look a little too similar. Previous story Kim Kardashian & Kanye West: Working on Divorce Agreement Just in Case?